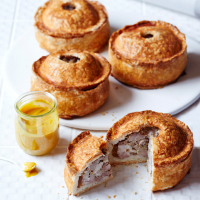 The original Melton Mowbray pork pie is a thing of beauty, and this is our version. Feel free to add a personal touch with herbs and spices – think allspice, cloves and fresh sage – or use bacon in the filling for a smoky hit. 1. Preheat the oven to 200 ̊C, gas mark 6. Mix the diced pork shoulder and belly in a large bowl and season with the salt and plenty of black pepper. Divide into 6 rough balls (about 170-180g each) and space out on a baking tray; set aside. 2. For the pastry, mix the flour and salt in a large mixing bowl. Put the lard in a small pan with 240ml water and gradually bring to the boil. Quickly pour over the flour, mixing it with a wooden spoon until mostly incorporated. Knead the dough in the bowl for a few minutes, until smooth (take care as it’ll be warm). Transfer to a clean work surface, divide into 6 even pieces (about 230g each) and cover each with cling film. out the remaining dough on the work surface into an even round. Grease the base and sides of a jam jar or pint glass (about 7.5cm in diameter) and cover with cling film. Shape the dough around the base, pressing it evenly up the sides, rotating as you go, until it’s about 8cm tall. the case; turn in your hands so the pastry sets around the sides – pinch it up a little, if needed, so it’s higher than the filling. 5. Roll the pastry reserved for the lid to a rough circle, slightly larger than the top of the pie. Lay over the top of the base and pinch firmly to seal to the sides; crimp with your fingertips, if liked. Cup the pie with both hands and press the sides gently upwards to help retain the shape. Transfer to a parchment-lined baking sheet and cut a 1cm hole in the top of the pie. Repeat with the remaining dough and pork to make 6 pies. 6. Glaze the pies all over with the beaten egg; bake for 25 minutes, until starting to turn golden. Remove, brush with more egg and bake, with the tray rotated, for a final 15 minutes, or until deep golden. Transfer to a wire rack to cool completely; chill. set over a medium-high heat until crisp (about 4-6 minutes). Add the stock and bay, and boil rapidly until reduced to about 300ml; strain into a jug (top up with water, if needed). Meanwhile, soak the gelatine in cold water for 5 minutes, until softened. Squeeze out the excess water, then stir into the hot stock. Cool completely, then chill for 10 minutes (reheat and chill again, if it sets). 3 days (or can be frozen for up to 3 months).